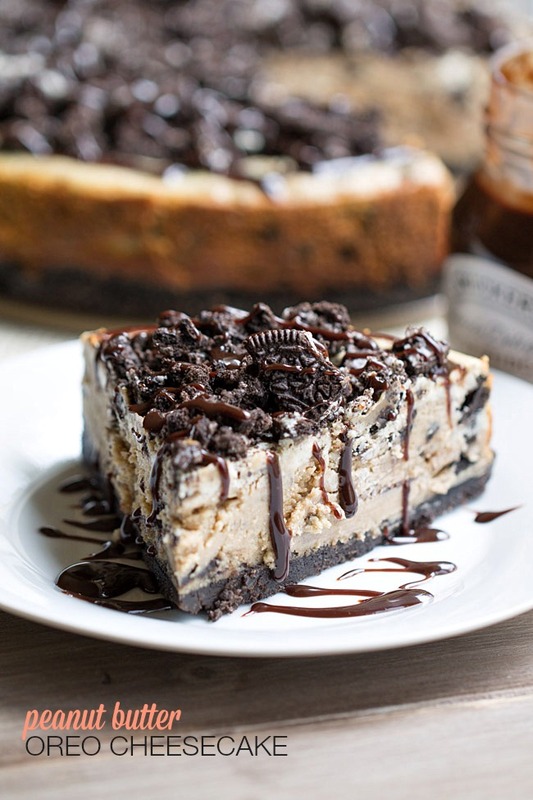 Let’s celebrate Wednesday and the start of vacation with a slice of this dangerously good Peanut Butter Oreo Cheesecake. 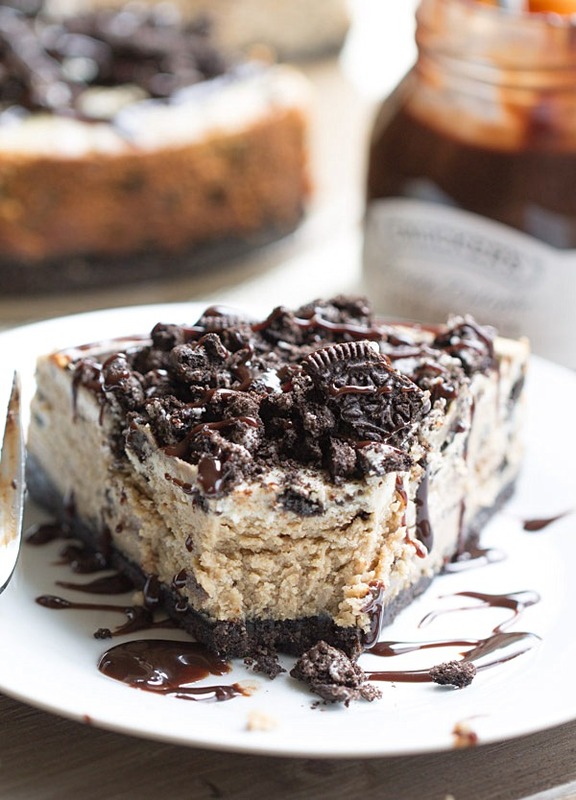 This cheesecake comes to you courtesy of my quest to make a delicious cheesecake filled with peanut butter and Oreos. It also comes to you on the first day of my vacation. Right about now I’m either boarding a plane, soaring through the sky or having a mighty good time in Vegas, depending on the time you’re reading this. I may even be dreaming about this cheesecake. Because I know there are still a few slices left, waiting to be devoured by our friend who is watching our house and the dog, while we are away. So contests, giveaways and gambling all go hand in hand with Vegas, right? To get you into the vacation spirit and the Vegas celebration right along with me, I have a fun little giveaway to share with you today. Yep, the fun doesn’t stop at the cheesecake. 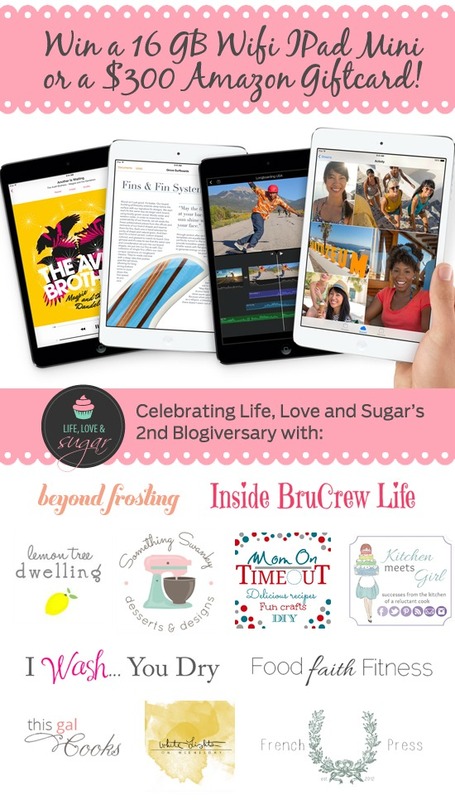 It continues with the chance to win an iPad Mini or a $300 Amazon gift card. Decisions decisions. Which would you choose if you won the giveaway? Entering is easy. You’ll find instructions along with the entry form at the end of this post. Let’s talk about this cheesecake a little more. This cheesecake, it’s crazy freaking good. I based it off of my Pumpkin Pie Cheesecake recipe. I replaced the pumpkin puree with peanut butter and left out the pumpkin spice. 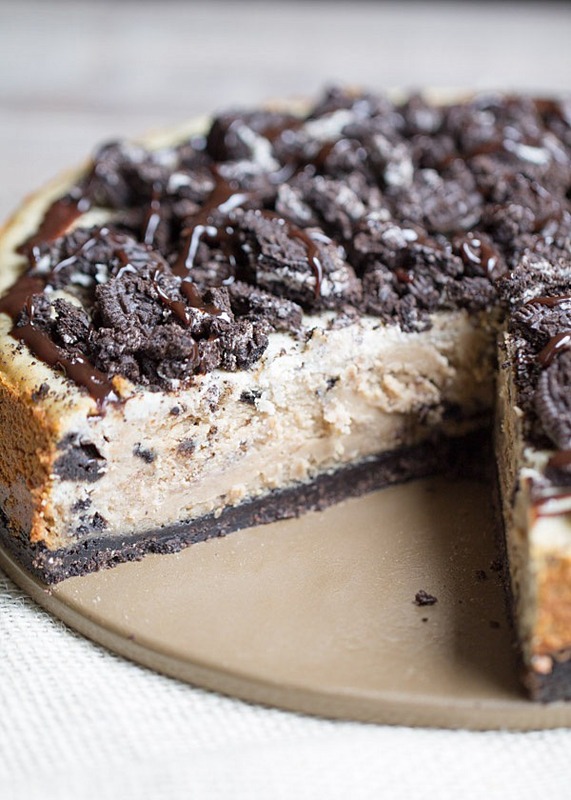 I made a dangerously good Oreo cookie crust to support the soft, creamy cheesecake. 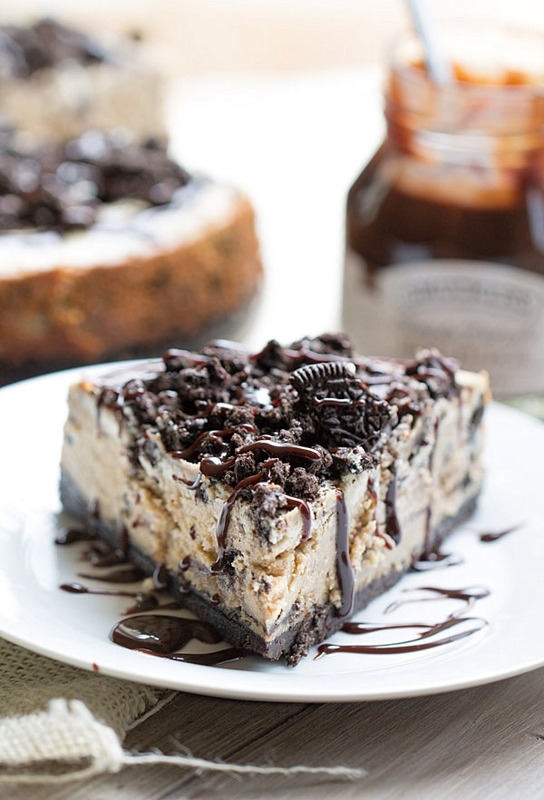 I filled the cheesecake with Oreo cookies and then topped with with crushed Oreo cookies and hot fudge drizzle. There’s so much to love right here. Make the crust by combining the melted butter, sugar and the ground Oreo cookies. Mix in the butter until well incorporated and all of the ground cookies are moist. Press the mixture into the bottom of a 9 inch springform pan. In the bowl of a stand mixer, beat together the cream cheese, ¾ C granulated sugar and the vanilla extract on medium speed. Add the eggs one at a time, beating between each addition. Mix in the 9 crushed Oreos and then remove 1½ C of the batter from the mixing bowl and set aside. To the remaining batter, add the peanut butter and the remaining ¼ C sugar and mix on low until well incorporated. Pour half of the peanut butter batter over the crust and carefully even out and smooth with a spoon. Pour half of the plain batter over the peanut butter layer and carefully even out and smooth with a spoon. Repeat this process until the remaining batter is used. The final layer should be the plain batter. Bake at 325 degrees for 60-90 minutes or until the center is slightly jiggly. If the top of the cheesecake starts to darken too much, cover with aluminum foil. After baking, remove the cheesecake from the oven and allow to cool in a fridge overnight. Once cooled, top with the 10 crushed Oreos and then drizzle with the fudge sauce. My cheesecake slightly cracked on the top. I know there are methods that you can use to prevent this from happening. Unfortunately, I did not use one of those methods as my pumpkin pie cheesecake has never cracked. If your cheesecake cracks, have no fear! The Oreo topping will cover the crack! A few readers who have made this cheesecake had an issue with some of the peanut oil from the peanut butter leaking from their pan. I'm not really sure how to prevent this but you could set the cheesecake pan inside another pan to prevent any leaks onto the bottom of your oven. You could also set a pan on the rack directly below the cheesecake to catch any leaks, as mentioned by another reader. Check out these cheesecake recipes form around the web. Have a great time on vacation, Julie! I’ll take a slice of this cheesecake, please! That cheesecake looks incredible! Must pin for sure! Oh my freaking goodness! This cheesecake!! AMAZING! I wish I was house sitting for you so I could get those last couple pieces! I hope you have an awesome vacay! Thanks so much for joining the giveaway! I’m officially dubbing you the queen of all things in a pie crust! Pinned! Love PB in any way :) Looks awesome and saw it on FG! Thanks, Averie! It’s dangerously good! ooh my chocolate cravings have definitely kicked in right now.. this cheesecake is amazing! This looks so good and very easy to make. I saw this on Saturday Night Fever. I also pinned and sent it to my sister…she’s obsessed with oreos. What size pan please ? Recipe says 9 inch?? I’m not good with cheesecake, so wanted to double check that it’s 10 inch before I attempt! This looks easy enough to make, and oh so yummy!!! I just checked my springform pan and it is a 9 inch pan. I hope you enjoy the cheesecake! I am definitely making this today! 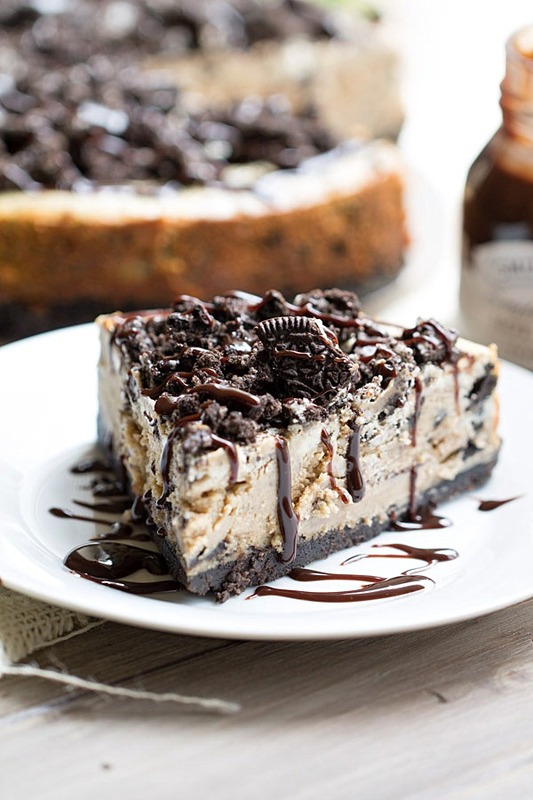 I have some peanut butter Oreos and will try those with this cheesecake! I’ll let you know!! Thanks for a great recipe! Oh peanut butter Oreos? Why have I not seen these before?! I hope you enjoy the cheesecake. Let me know how it turns out with those peanut butter Oreos, Donna! Where can peanut butter Oreos be purchased? You can find them at any grocery store that has a good selection of Oreo varieties. I’ve seen them at Winn Dixie, Wal-Mart, Target and Publix but I think it will depend on your market as some locations carry more variety than others. However, this recipe does not use peanut butter Oreos. It uses regular Oreos. The cheesecake filling has peanut butter mixed into it. Why can’t you use natural peanut butter? Also, you don’t mention adding the 2 tbsp sugar from the ingredients list to the crust in the instructions. Did you do this or can the sugar be omitted here? I’m wondering if it would make the crust too sweet. Thanks! Natural peanut butter does not have the right consistency. It’s gritty and will not work well in this cheesecake. I made this yesterday for a friends birthday. It was a hit!! So delicious, thick, and rich, just the way this is supposed to be! Thank you for sharing; I will be making this again! I made this at the request of a friend for his birthday. It was a hit!!! I was rich, creamy, and just as delicious as you think it will be. I will be making this again! I was wondering if I can use regular Cream Cheese, and Raw sugar instead? yes, you can use regular cream cheese. And raw sugar should be fine. You may need to beat a little longer to ensure the raw sugar dissolves, though, since the granules are typically larger than those of regular granulated sugar. I followed your recipe and everything and it didn’t cook all the way through and it tasted sour. I’m not sure what I did wrong. I even bought a band new 9” spring form pan for this. Guess its back to the store. 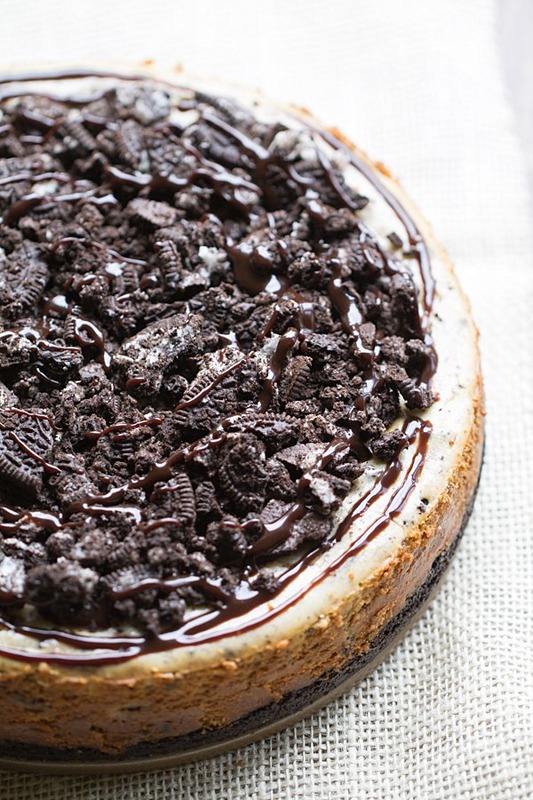 I’m just going to do a simple one with Oreo crust this time. I’m sorry that this recipe did not work for you. Did you use regular creamy peanut butter (not natural)? Did you use the raw sugar? Wish I could help to figure out what went wrong. Heavenly cheesecake!! I did have a problem with leaking peanut oil in my oven though…but then I put a cookie sheet on the next rack down to catch it & it worked out! This cheesecake is absolutely DELICIOUS! The batter was amazing, can’t wait to try it when it cools and I can finish it up! hii … i really loved your recipe , and i want to try it out , but i only have homemade peanut butter ,, regular peanut butter is pretty expensive around here ,, so do u rlly think the cheesecake wouldnt come out good .. i think maybe if i creamed the peanut butter well it wouldnt go wrong … and another questions plz , do i need the layers part or can i juts mix the whole mixture for once ???? Homemade, all natural peanut butter will not work the same as the regular creamy peanut butter. The consistency is totally different. I don’t the cheesecake will turn out right if you use the homemade but if you try it, please do stop by to let me know if it worked! As far as the layers goes, I think you would be ok mixing all together but I cannot guarantee as I’ve only made it using the layer method. so i just made this with homemade peanut butter , and i had no texture problem , it was perfect, very creamy , no crumbles … now i did adjust the recipe a bit , i replaced 1 cup of cream cheese with 1 cup of yogurt which made my cheesecake a bit sour but it was totally fine with me since sourness is what i like about cheesecakes .. i also added 1 tablespoon cornflour … maybe the things i added fixed the natural PB problems , i dnt know .. and the layers part , my mixture was a bit runny so i couldnt make it , instead i made it swirl with both mixtures which looked nice ..
Hi Sally! You’re welcome. So glad the recipe worked for you and that you enjoyed it. :) Thanks so much for stopping by to let me know! Hey Julie! 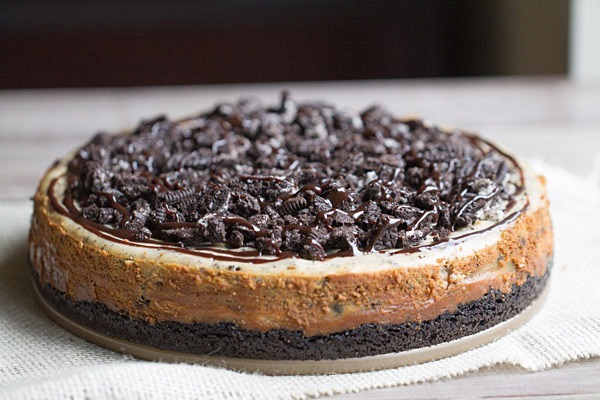 Let me apologize in advance because I really hate being the person who comes and tries to nitpick a recipe buuut I really want to want make an oreo cheesecake and i cant seem to find a good recipe for a baked oreo cheesecake, all the ones I am finding are no-bake recipes. Your recipe looks INCREDIBLE but unfortunately my fiance isn’t really a fan of peanut butter. Is there any way I can make this without the peanut butter? In the pictures your cake looks thick and lovely, if I leave out the peanut butter will that effect the texture? Hi Julie, I’m doubting you’ll see this comment in time but when cooling the cheesecake over night, do we need to cover it with something? So this is probably a dumb question but I’ve never made a cheesecake before and I’m trying to impress my husband lol. Do I scrape the filling out of the Oreos to make the crust? You don’t need to scrape the filling out of the Oreos. I’m thinking of making this for my husband for Valentine’s day this year! I’m wondering how it might taste using a honey peanut butter – like the one that peter pan sells. What do you think?